In Nigeria, Chinatown Vendors Struggle For Profits Nigeria has Africa's largest Chinese population, and many Nigerians see Chinese businessmen as an unstoppable force. But some shop owners at the Chinatown in Lagos tell a different story. The Chinatown in Lagos, Nigeria, was built in 2004. It's home to more than 100 shops that sell everything from ceramic coffee cups to Hannah Montana backpacks. This month, NPR is examining the many ways China is expanding its reach in the world — through investments, infrastructure, military power and more. In this installment, a tale of two Chinatowns in very different circumstances — one in Nigeria and the other in the Italian town of Prato. The Chinatown in Lagos, Nigeria, is one of a kind. It looks like a big, red medieval fortress with crenellated walls that resemble the Great Wall outside Beijing. A Nigerian flag and the Chinese flag fly together on the ramparts. Inside is a courtyard filled with 180 shops, selling everything from blue jeans to High School Musical sketch pads. But many stores are shuttered and dusty. Chinese clothing imports practically destroyed the Nigerian textile industry, so six years ago, the Nigerian government banned them. "The impact is that most of them [Chinatown clothing shops] had to shut down," says Solomon Julius, a Nigerian who manages Chinatown. Nigerian companies have also tried to crack down on Chinese businesses for selling pirated CDs and DVDs. Ope Banwo, an entertainment attorney, accompanied police on a raid of Chinatown in 2006. Banwo says cops found bootlegs of Hollywood films. Then, Banwo says, something strange happened: Police received a phone call and let everyone go. He says it was clear to him that somebody intervened to save the merchants from arrest. [The Chinese have] taken over this economy like they're taking over the world. "When I say, as a lawyer, they're being protected by the powers that be, I don't say it lightly," Banwo says. "I saw that. And they left those guys with everything." Today, you can't find pirated DVDs in Chinatown, but people sell them just outside the gate. 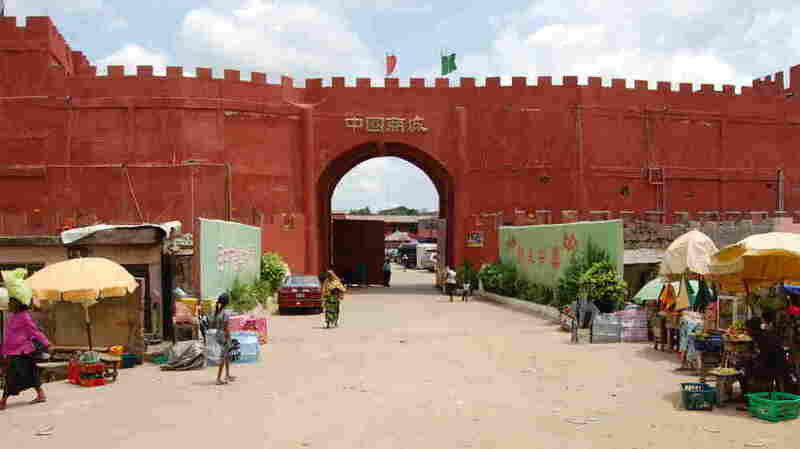 Like many Nigerians, Banwo sees Chinese businessmen as an unstoppable force. "They've taken over this economy like they're taking over the world," he says. "The next superpower is China." Some vendors in Chinatown tell a different story. Huang Haifeng owns a tiny shop that sells doors and cheap Chinese suits. He says doing business in Nigeria is brutal. Huang Haifeng owns a shop that sells doors and men's suits. Many Nigerians see Chinese as indefatigable businessmen, but Huang says operating in Nigeria is tough. "I want to quit trading," Huang says. "There are no profits." "Even last year, we lost much money. In dollars, last year [$80,000] or $90,000. Even some Chinese, they lost more," he says. 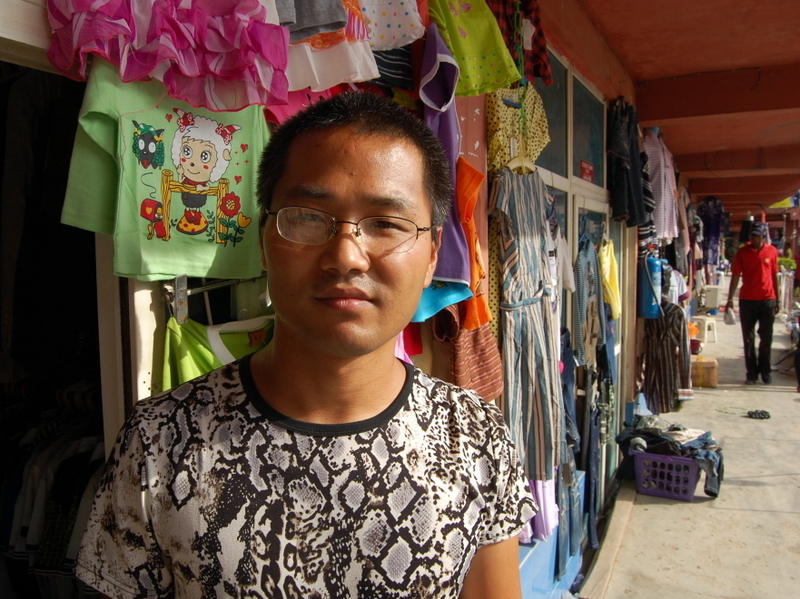 Huang moved to Nigeria in 2002, because the country has Africa's largest Chinese population and he saw a huge potential market for Chinese goods. Huang imports the suits he sells from China, but Nigeria is notoriously corrupt, and Huang says some of his suits are stolen in customs. "Sometimes, each bag, you're short five or 10" suits, he says. Huang says manufacturing in Nigeria isn't much easier. He imported parts and tried to build doors in a factory here to save money. But Lagos suffers blackouts several times a day, which makes operating a factory difficult and expensive. I want to quit trading. There are no profits. "The cost was too high, because there's no power," Huang says. "We're always using diesel, and the engineer is not as good as a Chinese engineer." A third big problem, Huang says, is exchange rates. The Chinese currency, the renminbi, is strengthening, raising the cost of his products. Meanwhile, the Nigerian naira has weakened, reducing his purchasing power. Some Nigerians think the Chinese are taking over the country, but Huang shakes his head. "No, I don't think so," he says. "I don't think so." Tony Jun agrees. He runs a Chinatown shop that sells everything from 50-cent ceramic coffee cups to $10 Hannah Montana backpacks. But after nearly a decade in Lagos, Jun says it's no longer worth it. He figures he can make more money back home. Jun plans to move back to China in the next year.